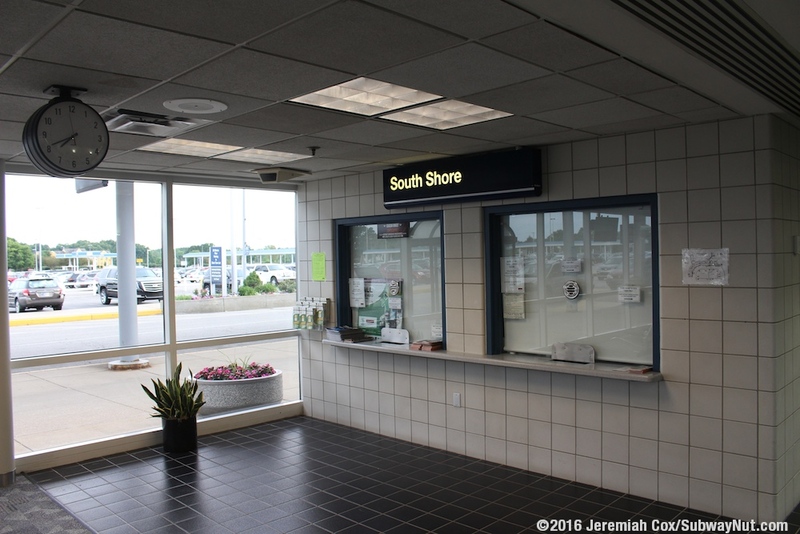 The South Bend South Shore Line Station is presently located at the small South Bend International Airport (International in name only, a customs facility is still under construction). 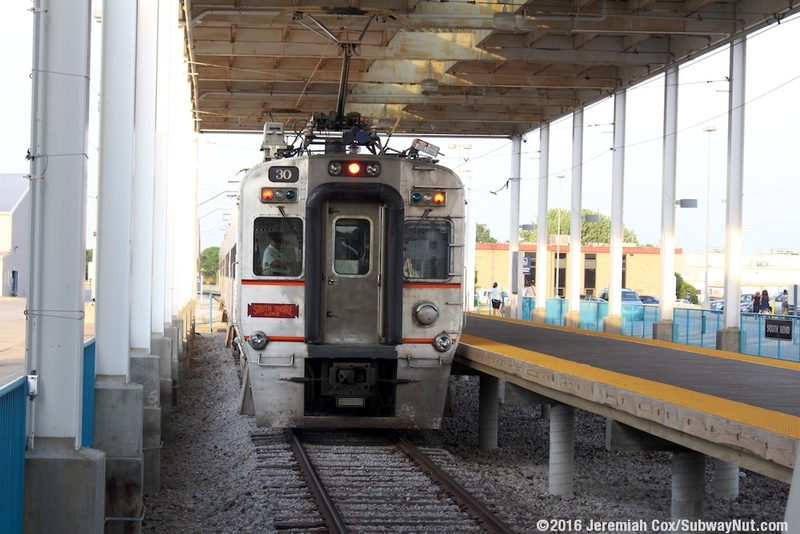 The station is also located in Eastern Time with every other South Shore Line stop is in Central Time. 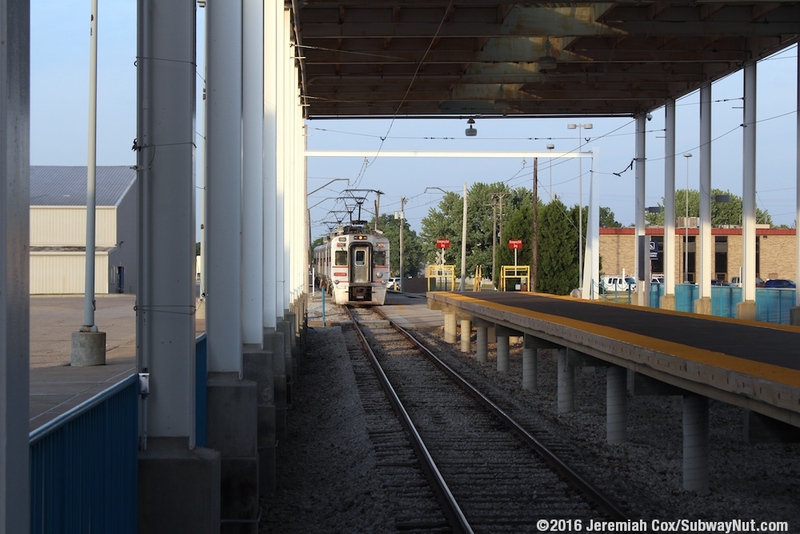 The stop receives higher ridership on weekends from discretionary riders (plus an on-slot of riders for Notre Dame home football games) than weekday commuters due to the long 90 mile distance between South Bend and Chicago. 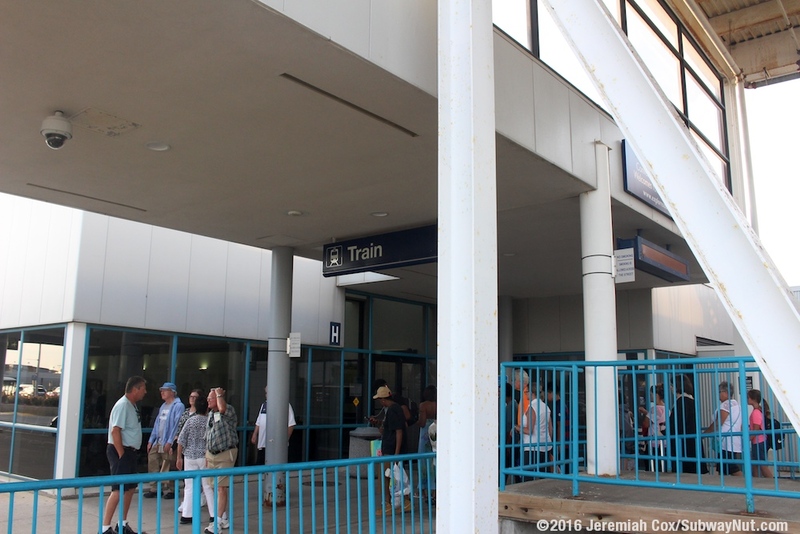 Trains were rerouted here to the airport in 1992 from a station that was previously shared and is still used by Amtrak station, locally the Amtrak Station is known as the Bendix Station. 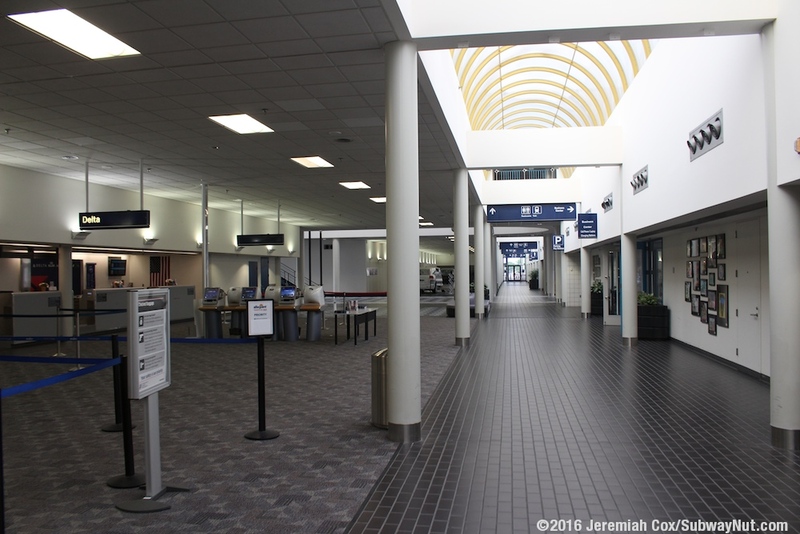 The airport was even renamed the Michiana Regional Transportation Center starting in 1992 since the South Bend Greyhound Station is also located here. 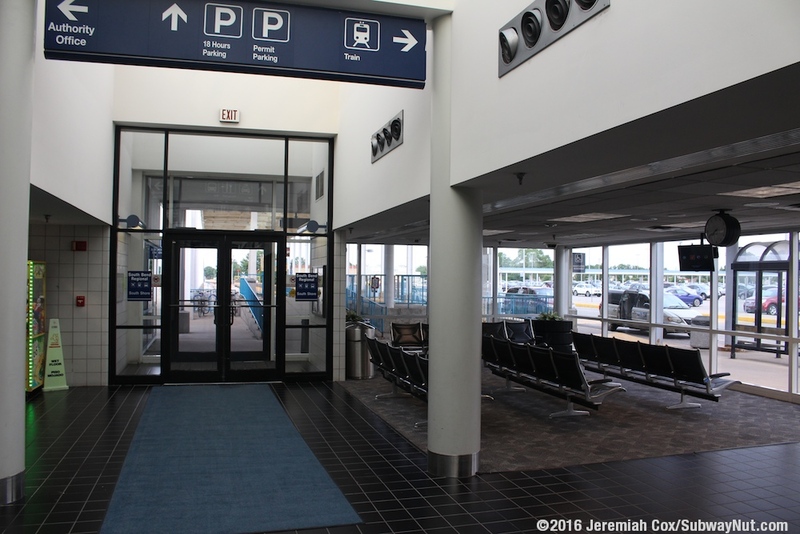 The name reverted back to South Bend Regional Airport in 2000 because the name for the region, Michiana isn't nationally known. The former South Shore Line track is still intact and closest to the Amtrak depot just before the track ends. 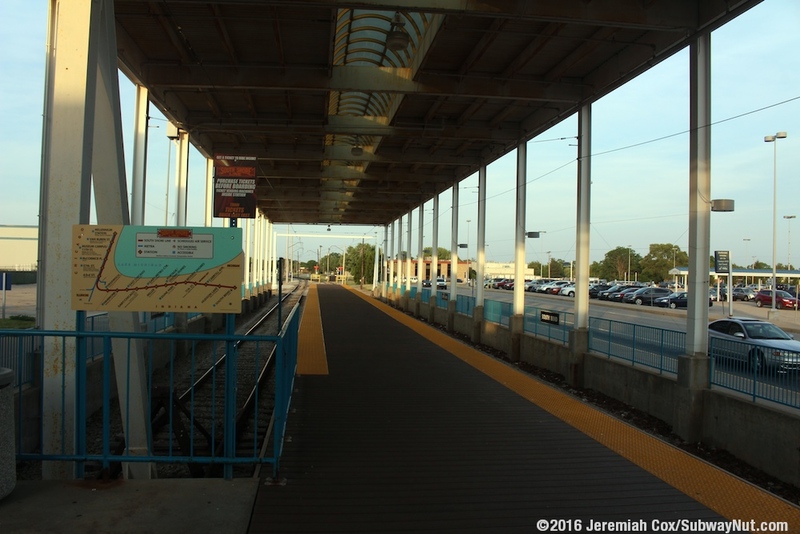 The Bendix Station only opened in 1970, as a replacement station for the South Shore Line (and intercity rail service that became Amtrak) route that previously continued downtown using street running largely down Orange Street and LaSalle Avenue into downtown. The line ended at a small yard on what today resembles an island between the East Race Canal and main (West Race) of the St. Joseph River on the eastern edge of downtown. An apartment complex, The Pointe occupies the former rail yard. The main terminal station in downtown was located at Michigan and LaSalle Streets. 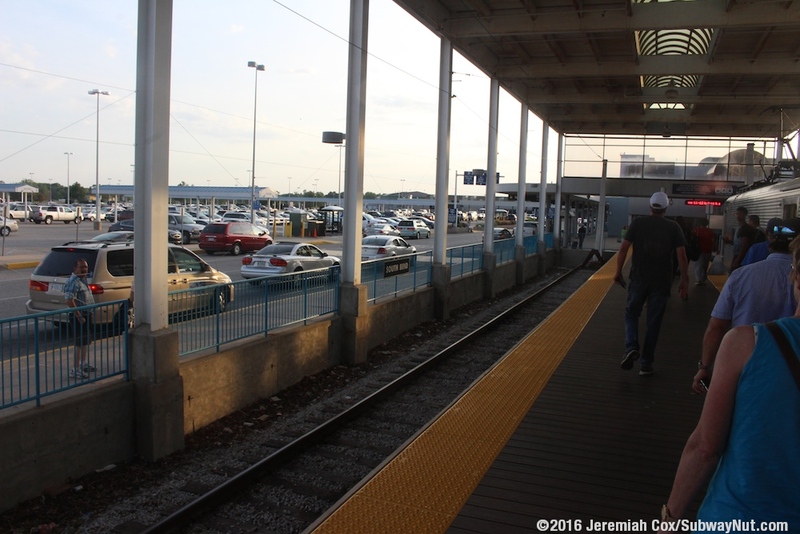 The extension to the airport largely runs down a former freight spur along Bendix Avenue that was barely upgraded for new train service and is extremely slow. 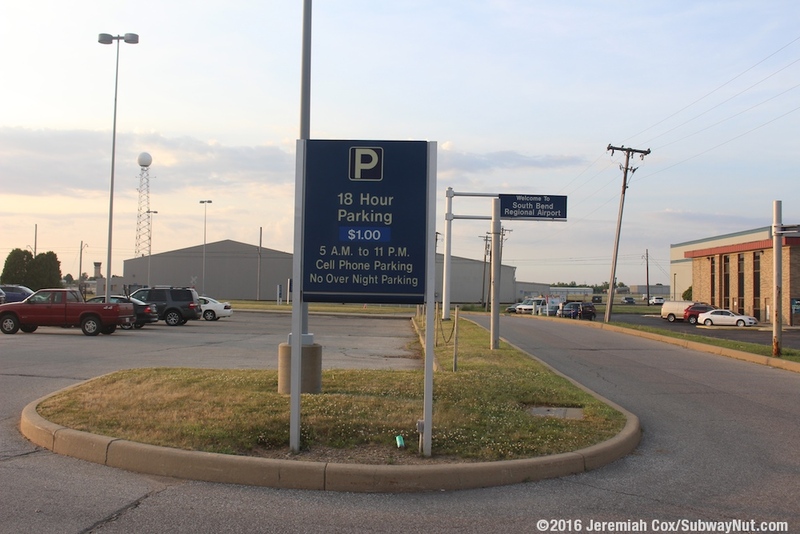 It's a 10- minute ride from Bendix plant area into the Airport, with the train platform at the eastern end of the airport. 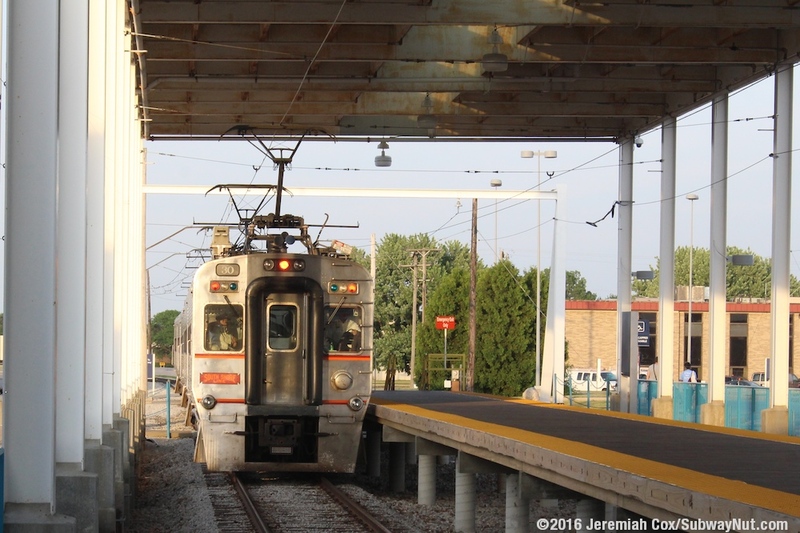 It is NICTD's long term goal to relocated the South Shore Line on a greenfield route to a new station platform on the eastern side of the airport that could save 10 minutes of travel time, reduce the number of grade-crossing from 23 to 7, and would only cost $15 million. Ideally though improving the South Shore Line in South Bend should be part of the currently attempted long-term economic revitalization of downtown South Bend, and rerouting the line (possibly using new tracks along the Norfolk Southern ROW) should be a top consideration. 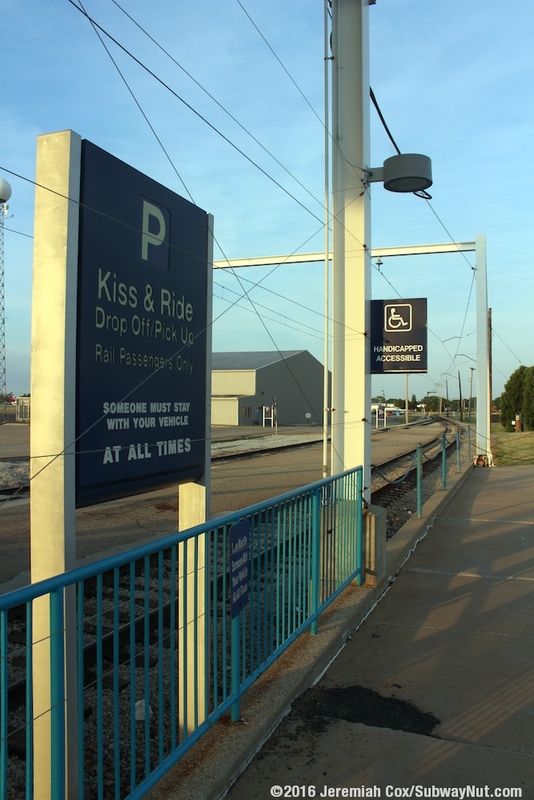 A new 'commuter' park & ride station along the ROW south of the airport right off of the US-31 bypass (near Mayflower Road) could supplement this extension to serve regional riders. Getting downtown is impossible. Today there isn't even decent bus service, on weekends especialy, during weekdays TRANSPO Bus Route #4 runs every half hour (hourly service for the last few evening trips) from 6:30am to 9:30pm from the Airport to Downtown. On weekends service is only hourly from 7:00am to 6:00pm with the real travesty of no Sunday service. Uber has also been banned by the Airport Authority, so the only option on Sundays is an expensive ($18) taxi ride. Today decent service isn't provided to South Bend for numerous reasons. First since 1970 the South Shore Line has lacked a yard in South Bend. This limits service with the first and last trains needing to deadhead to and from the yard in Michigan City. Although the airport train station has two tracks (with times when two trains are scheduled to be in the station at the same time) none are stored in the station overnight. This is in addition to the fact the line to Michigan City is almost entirely single-tracked with only a few passing sidings. 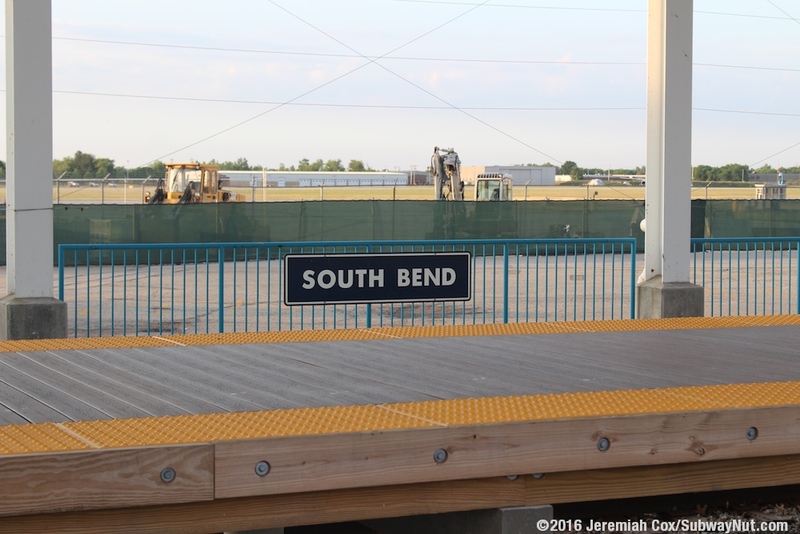 This means South Bend is only served by five trains per day to and from Chicago plus the two 'deadhead' runs in each direction (except for the evening return trips on weekends) that run in revenue service to and from Michigan City. In theory, on Sunday to Thursday nights there is sort of an extra middle of the night South Shore Line trip (with an hour long layover at the Carroll Street train platform). This is because last train from Chicago to Michigan City leaves at 12:46am, arrives in Michigan City at 2:24am, with the first in revenue service 'deadhead' trip to South Bend leaving at 3:30am, arriving at the South Bend Airport at 5:11am due to the time change. Ideally this train should become one trip, allowing South Bend residents a late night return trip option. The schedule, also caused by the fact South Bend is in Eastern Time with an hour time change from the rest of the system, also feels poor. Train service to South Bend from Chicago for example is poor, the first train doesn't arrive until just after Noon, 7 days a week (leaving Chicago at 8:45 CT) with the last train leaving Chicago at the early hour of 7:15pm on weekdays, on weekends at least this is at 9:15pm (arriving at 12:46am, due to the time change and long travel time). 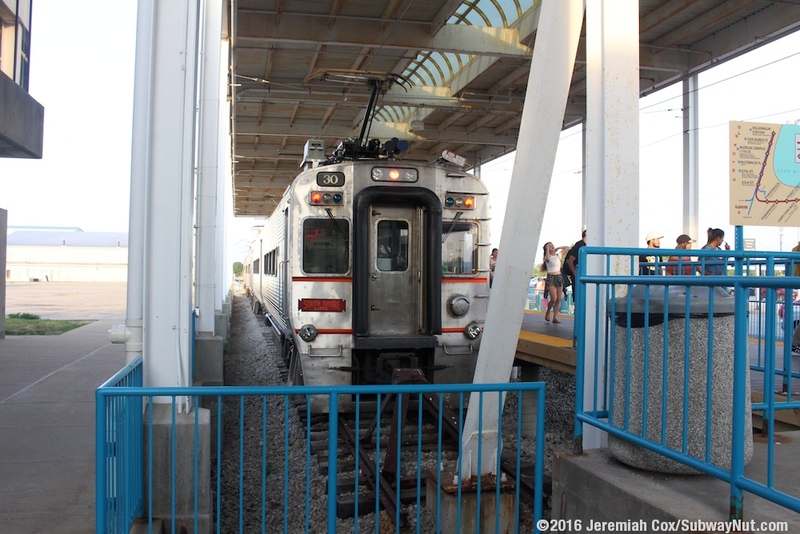 Until 2009, there was more weekend South Shore Line Service (with nearly all of the 9 daily trains to and from Michigan City today, running to South Bend) but service was reduced because of delays due to the single-track railroad between South Bend and Michigan City. 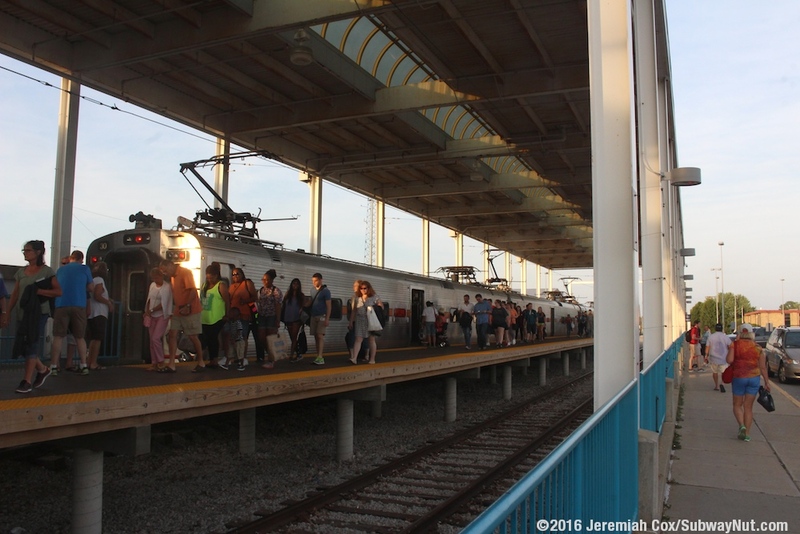 In March 2015, new Express Trains, the morning one dubbed the Sunrise Express began operating that leaves South Bend at 6:00am ET only stopping at Dune Park and East Chicago before arriving at the Chicago Stations by 6:55am; there is a similar return express train in the evening. The station itself consists of a relatively short, just 3 cars long high-level island platform for two tracks that end in bumper blocks alongside a single ramp exit off the platform. 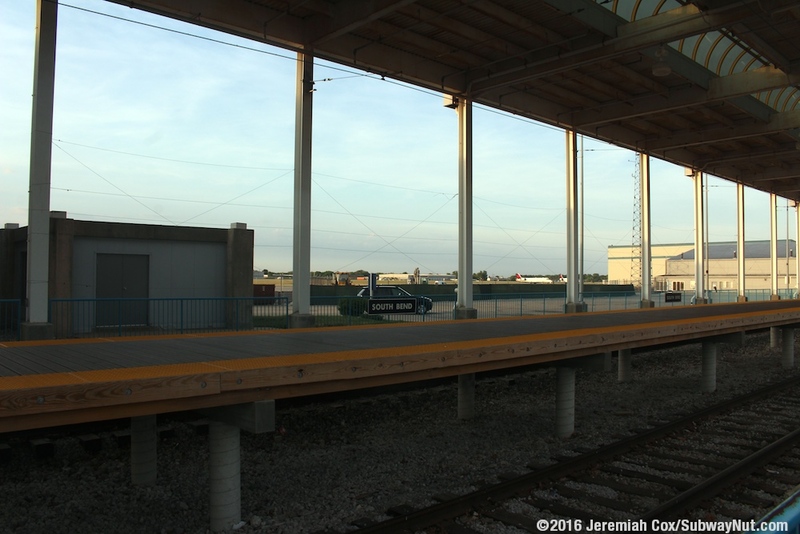 The platform has a modern roof that covers both the platform and tracks with white beams holding up the roof on the trackside edges. An arched skylight runs down the middle of the platform. The minimal fencing by the platform is blue. Surprisingly, the platform is made of wood. 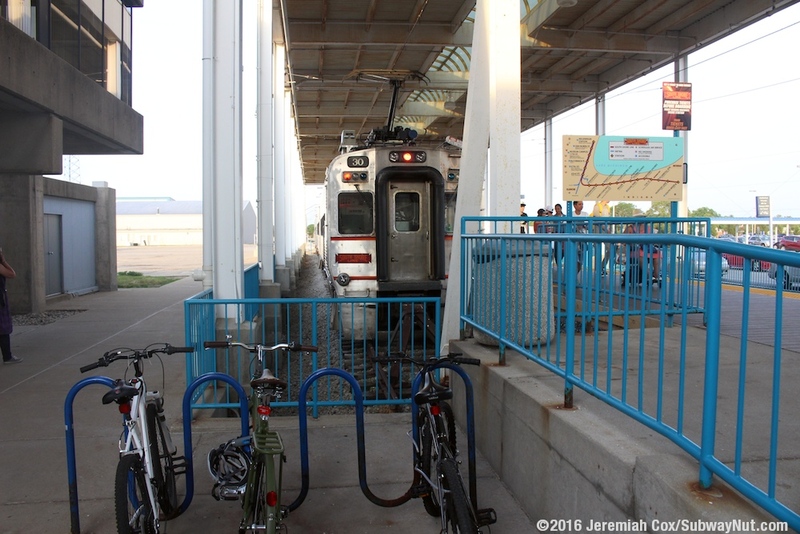 Just beyond the ramp off the platform is the airports only small blue bike rack. The roof of the platform connects directly with the canopies surrounding the airport building, and almost immediately automatic doors lead into the South Shore waiting area at the eastern end of the Airport terminal. 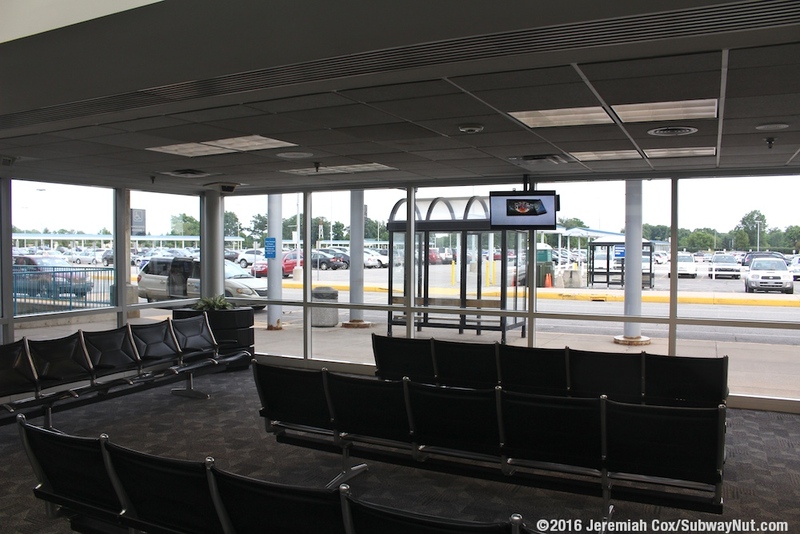 This waiting area feels like one in an airport with normal airport seating. There is even a television. 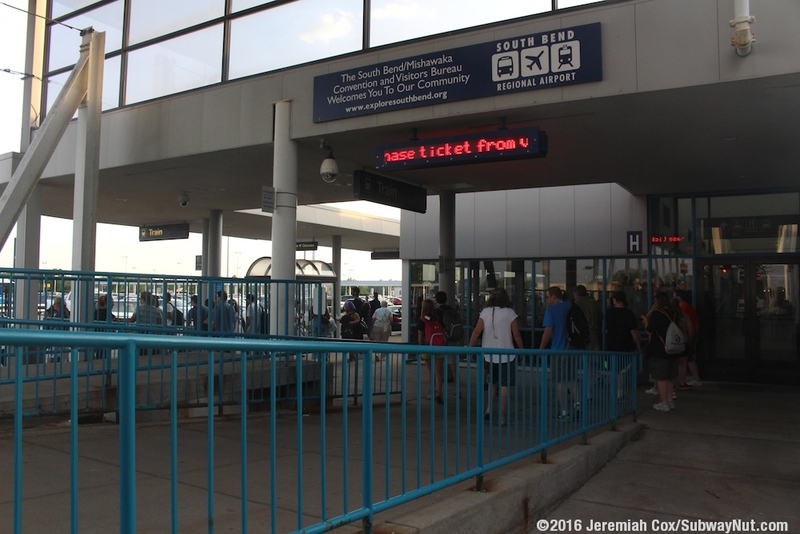 A train ticket office (with two possible ticket windows) is open for one morning shift Fridays to Sundays only since South Bend has higher discretionary weekend ridership than weekday commuter ridership. Nearby are two credit card only TVMs). Continuing down the single-level concourse area (the airport is too small to have separate roadways for arrivals and departures) are first the small airline ticket counters (currently Delta, United, and Allegiant serve the airport) Next is the entrance to the one security checkpoint (with just two X-ray machines, along with one wave-millimeter machine, and one metal detector) into the small 9 gate passenger terminal. 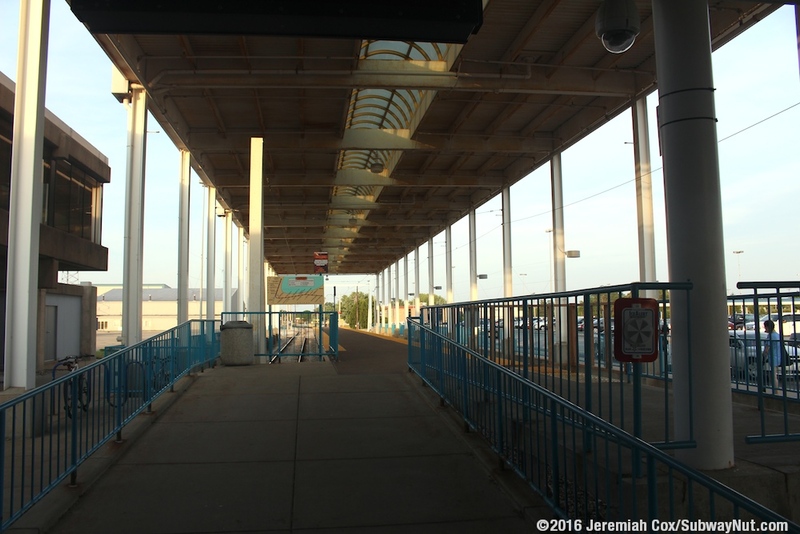 This is followed by the small baggage claim area before the finally the small Intercity Bus Terminal (used by Greyhound, Hoosier Ride provided by Miller Transportation, and Barons Bus Lines) is reached at the opposite end of the main concourse, complete with drive in/back-out intercity bus bays. CoachUSA also operates it's Airport Supersaver buses (costing over $40 one-way but these buses do continue to the Notre Dame campus after the airport) to O'Hare and Midway Airports directly from the regular passenger roadway. 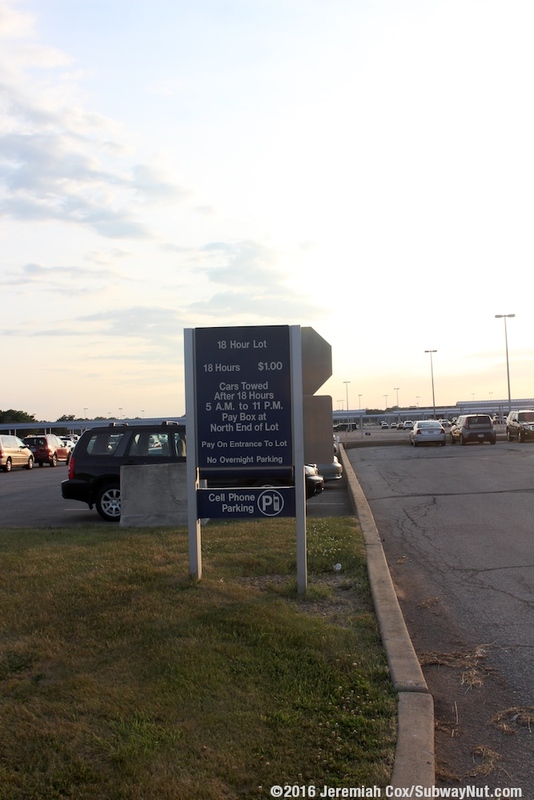 The concourse is along the main pick-up and drop-off roadway; here the South Shore Line simply says train on the small blue signs along the drop-off roadway as if it were an airline. The Transpo stop for the airport (although since Tranpso uses a flag stop system, with buses stopping anywhere deemed safe, lacking bus stop signs) is also right outside the entrance to the train station with it's own small shelter.